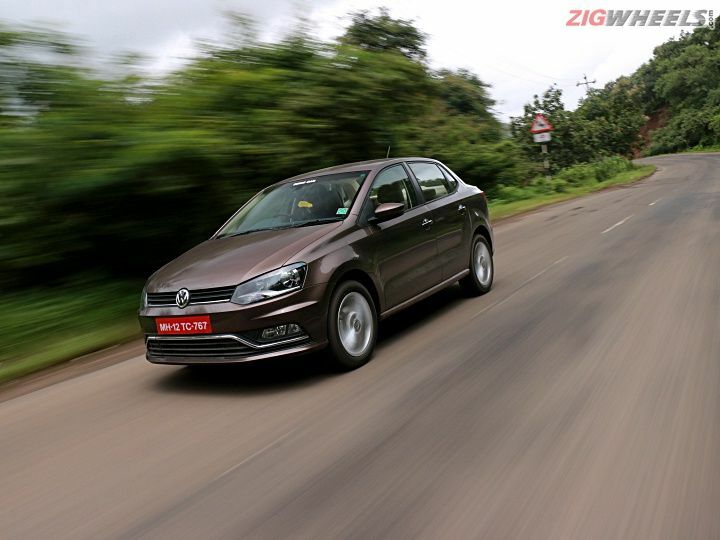 Volkswagen stealthily updated its Ameo and Polo lineup with a new 1.0-litre petrol engine in March this year. But does this lighter, more compact and more powerful mill inject some oomph into the rather bland Ameo petrol? Volkswagen has been laying low of late, so much so that it even silently axed the old 1.2-litre petrol engine from the Polo and the Ameo lineup in March this year. While the Polo GT TSI is still on sale and Polo customers have a nice driver’s car as an option, the Ameo petrol lineup only consisted of the bland 1.2-litre, three cylinder petrol. We finally managed to get our hands on the new Ameo petrol and were curious to see what this engine brings to the table. Power stands at 76PS@6200rpm and torque at 95Nm between 3000-4300rpm. This makes it 2PS more powerful than the engine it replaces but it does make less torque, 15Nm less to be precise. This new undersquare engine is also more compact to help free up more passenger space in compact cars and this is quite evident by the new empty space under the hood, just in front of the engine. Unfortunately, since the Ameo and Polo platform has remained unchanged, this space resides in the engine bay and hasn’t yet migrated to the rear bench where it’s much needed. Like the other two three-cylinder flavours we’ve tasted of late (Ford’s 1.5-litre & 1.2-litre petrols from the Dragon family), this new three-pot engine from Volkswagen is smooth and refined. At idle, there is barely a whisper creeping in through the nicely sound deadened cabin but there are hints of vibrations felt through the pedals, floorboards and the steering wheel. Around town, the engine feels quite peppy and wakes up from as low as 1500rpm with good low-rev response. In fact, the suggested gear shift indicator on the MID asks you to shift up to the next gear from as low as 1800rpm when the going is flat. It’s also a very linear engine with a seemingly flat power curve all the way up to its 6500rpm rev limit. But it doesn’t like to be hurried. Overtakes need a firm stomping on the accelerator and then you have to wait for the revs to build. Downshifting a gear, or even two, helps a little, but progress is similarly slow. On our performance runs the Ameo completed the 0-100kmph sprint in 17.41 seconds. This makes it one of the slowest cars we have ever tested. It’s even beaten by some cars from a segment or two lower and it’s also slower than some AMT-equipped cars, which are infamously slow to accelerate. What it is good at is commuting, doing a lazy road trip or just surviving the rush hour traffic on the way home. The steering is quite light and the gearbox shifts cogs smoothly. The cogs are widely spaced and this gives the Ameo a very flexible nature. In town, you can just pick a gear like 2nd or 3rd and the engine will be happy to stay in it almost indefinitely. It can even pull from as low as 1000rpm or from as low as 25kmph in 5th gear. So even though the torque output on paper drops in comparison to the old engine, low-rev performance is almost diesel good. It’s also nice and efficient in the real world. In our tests, we managed 13.92kmpl in the city. Depending on traffic in your city, you can look at getting anywhere between 13-15kmpl which is great for a petrol city runabout. On our highway run, it returned a happy 19.02kmpl. On the highway, and once you manage to accelerate up to triple-digit speeds, it's happy to hold them all day and as well. But you do have to plan your overtakes. Shifting down does help, but the Ameo is still slow to accelerate and so they will still take time. Ghat sections will also require to keep the little engine on the boil above 3000rpm with a heavy foot on the accelerator to maintain a reasonable momentum. Since the rest of the Ameo remains the same, this review focuses primarily on how the new engine mixes things up. If you want more details on the Ameo in general and to see how it fares against rivals like the Dzire and the Xcent, you can check out our review here. Just in brief, though, some of the Ameo Highline Plus’ features include dual airbags, ABS, a touchscreen infotainment system with Android Auto and CarPlay, rear aircon vents, an auto dimming rear view mirror and 16-inch alloy wheels. Niggles still include a cramped rear bench that’s really only comfortable for kids and its rather stiff ride quality. And while we may have referred to its ride and handling as sporty before, with this engine, that’s focused on commuting, the firm ride is more of a negative than something we’d think of positively. So let’s start with what it’s not. It’s not the powerful driver’s car that the Ameo diesel is. It's also not available in an automatic option that other sub-4 metre sedans like the Dzire and the Amaze are. And while it is more refined and frugal than the engine it replaces, it’s not quite bringing any more excitement to the table than its predecessor. It’s still the well built, safe, feature loaded car that it always was with the build quality that the Germans are famous for. The new engine is friendly, refined and efficient and the price is on par with the biggest rivals in the segment - the Dzire and the Amaze. If a hassle free, efficient petrol city slicker is something you are looking for, the Ameo 1.0 petrol could be an offbeat choice worth looking at. The few plus points Maruti enjoys are strong after sales service,availability of spare parts,model lineup,higher resale value & fuel efficient engines combined with Japanese technology.. When is the NG Polo been introduced to Indian market? The few plus points Maruti enjoys are strong after sales service,availability of spare parts,model lineup,higher resale value & fuel efficient engines combined with Japanese technology.. When is the NG Polo been introduced to Indian market?